I probably say the words Universal Studios about 20 times an hour. It's an amazing theme park that features some amazing experiences. Recently when I went, I rode the newly opened Skull Island: Reign of Kong ride and was both amazed and blown away by the mixture of 4D screen simulation and classic dark ride elements. It really took you into the experience of having an adventure on Skull Island and being caught between Kong and some dinosaurs. The entire ride was part of the experience, even the line was part of the attraction. 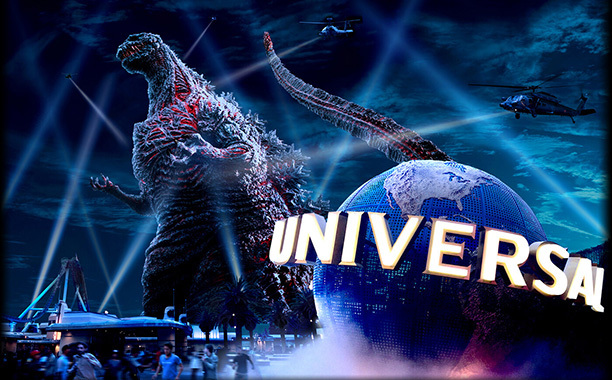 That's some of the magic that only Universal Studios can bring to life. You are literally plopped out of reality and dropped into the movie each ride is based on. So as I find myself imagining the possible scenario for a USF Godzilla attraction, I find myself thinking it would be perfect to retrofit the Shrek attraction as a 4D experience with Godzilla. It's not far from the Transformers ride, so I wouldn't have to walk far to hop from one to another (it's my daydream after all). Not to mention Monsters Café is nearby and naturally matches up with the theme on it's own (and it's really good food too). The theater could have all those seat shaking moments, blasts of water, heat, lights, and smells to go with the movie. All while the façade could be right out of Monster Island. It would be rad. Ideally, I'd love a simulator ride or a hybrid ride like Skull Island. But I'm thinking within the confines of the park already and going with the rumor that the Shrek attraction will close soon (the one in Hollywood will soon after all). He just needs a pink bow. Now here's where I really start reaching. You see there's a Sanrio store at Universal Studios. That's Hello Kitty and her pals. Well... Hello Kitty is a Godzilla character. 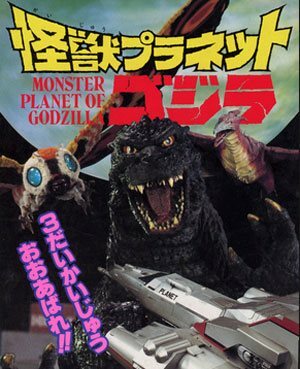 As in, in the early 90's there was a Godzilla simulator ride at the Sanrio theme park in japan. 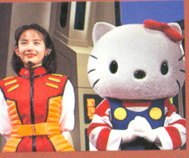 Part of the ride film featured Hello Kitty as an in universe character.